One of the survival mechanisms parents pick up is the skill of time travel. Referred to as “tardiness” by the not-yet-parents crowd, this ability allows me to change “Pizza Thursday” to “Pizza Friday” when necessary. In fact, there isn’t a today that I can’t change into tomorrow. And it never takes me more than 24 hours. This week’s pies utilized my sourdough starter, if just to keep it fed and alive. Because the weights of the flour and water in the starter are equal, it was easy to replace a portion of each with the sourdough in my crust recipe. I used enough of the starter to make up about 1/3 of the total weight of the flour—300 grams (half that is water). 1 28-ounce can organic crushed tomatoes. I used Muir Glen fire-roasted, hoarded during recent sales. CM and Whole Foods brands sell for a reasonable price. small spring of fresh thyme and bigger sprig of fresh oregano from the backyard. If you’ve recently bought a basil starter plant from one of our local sources (Central Market and our farmers markets have started selling starters), you can even sauce up your saucin’s with the tomato’s best buddy. Combine the garlic and water. In a wide-rimmed saucepan, heat up the olive oil on medium heat. I use my All-Clad 3-quart saucier. You can use a large skillet, too. The broader surface area promotes quicker thickening. Stir in the garlic mixture and saute until the water evaporates and the garlic smells fragrant. Dump in the tomatoes and herbs (except basil) and simmer over medium-low to low heat (thwap! thwap!) until thickened, about 10 minutes. Don’t overcook or your sauce will lose its fresh flavor. Salt to taste and let cool before saucing your pizzas. I can’t hardly bake a pizza without miso-ing it up. So I spread one pie with South River‘s organic white miso and dabbed another with SR’s meaty three-year barley miso (Add a healthy dose of the barley miso to your hummus for a vegan version of liverwurst. Maybe that’s not the most enticing endorsement but it sure savories up animal-free fare.) 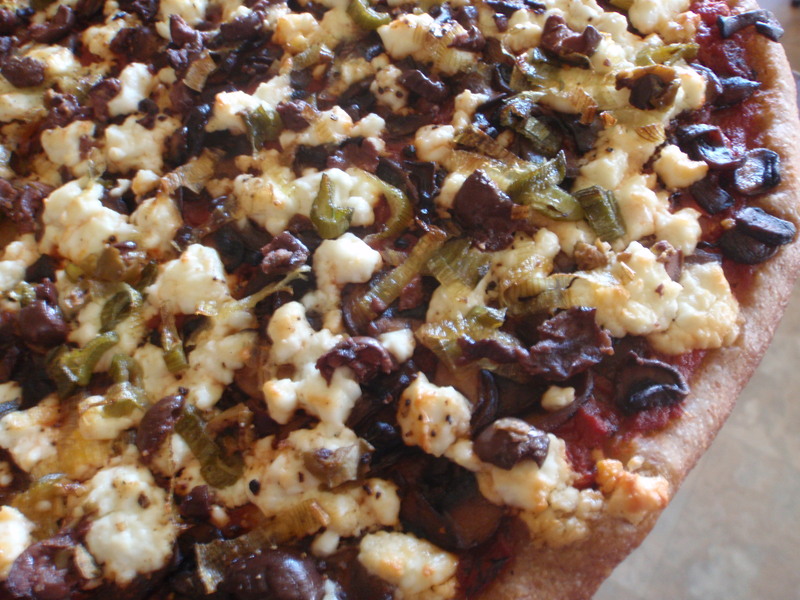 The final pizza trekked a little truer to its Mediterranean heritage, covered with sauteed Texas-grown cremini mushrooms (on sale at CM for $3.99 a pound), Pure Luck goat feta, chopped olives and olive oil-doused Texas spring onion slices. Happy Pizza Day, whenever you are! Stealthy Pizza Thursday sneaked up on me, catching me nearly cheeseless, without mushrooms, sans spinach and the kindergartner’s school pickup looming. Action! The junior pizzaiolo patted out the crusts. Muir Glen canned fire roasted crushed tomatoes (stocked up on sale)), well drained, blended with dried basil, oregano and surplus fresh thyme still on the counter from beanin’ day. Plenty of organic garlic, a little turbinado sugar, a couple of anchovies mashed up and the last of that jar of South River’s organic white miso plus an assortment of minced olives (I especially love those dry cured shrivelly black olives, their bitter edge heightening all flavors within reach) combined to tsumanic umamic effect. Full Quiver Farm‘s raw milk cheddar melded the mashup, festooned with the obligatory olive oil-lubed Hillside Farms red onion slices. Peppered with freshly cracked black pepper, and crushed red pepper and pickled jalapeño peppers for the peppery adults, these pies packed a palate poppin’ punch! P-P-P-Pizza please! all drizzled up and someplace to go! The current issue (January 2010) of Cook’s Illustrated magazine offers a couple of terrific recipes to get you bakin’. 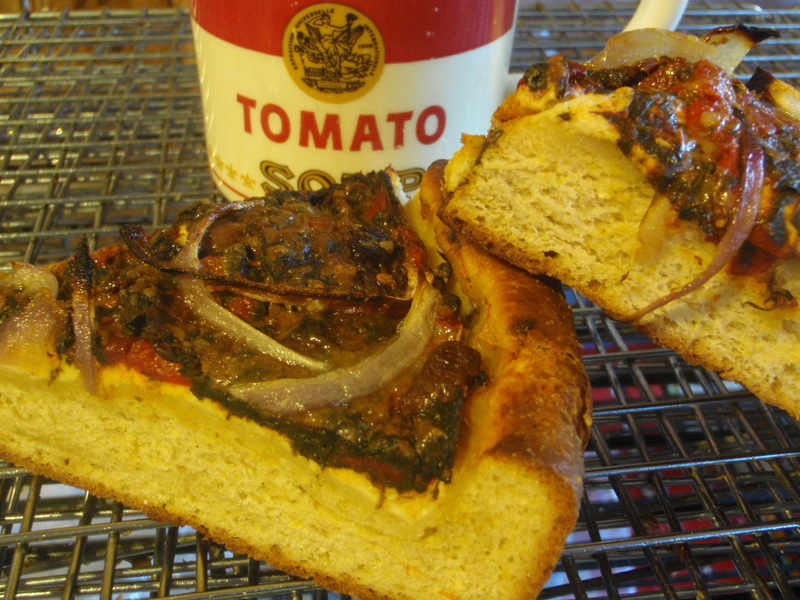 I started with “Chicago-Style Deep Dish Pizza,” which CI tells us consists of a buttery,cornmeal enhanced flaky and biscuit-like crust supporting a cheese-first, tomato sauce topped filling. Having cut my pizza teeth on Conan’s (what kind of Cook County native am I? ), I wasn’t aware that the Windy City’s famous crust sported buttery layers (I was only 8 when I left for the south.) But I’m not at all surprised to learn that the Midwestern take on Italy’s precious pie boasts butter and lamination. Now that’s cooking from the Heartland. Chicago’s version of pizza, like its Italian inspiration, is all about the crust, apparently. But second city cooks really give the dough a 180. I don’t mind a bit! If I can find a way to put butter together with starch (we’ll get to sugar shortly), I’m gonna! Of course I modified the dough some. I enjoy whole grains so I worked in a little white whole wheat flour and that necessitates additional liquid. Filled on the fly with an entire 10-ounce bag of Cora Lamar’s legendary Texas-grown spinach (Central Market, $2.99 a bag, triple-washed and ready to wilt), roasted piquillo peppers, black olives, basil, oregano and just enough organic canned tomato to qualify as a “sauce,” plus a half pound of organic cream cheese blended with a dollop of South River’s organic sweet white miso and plenty of black pepper (we were all out of Full Quiver Farm‘s melting mozzarella—but who am I to stick with tradition anyway?) and adorned with the requisite red onion (anointed with a touch of olive oil) and reggiano, these scrumptious pizzas reminded me of a more refined savory kuchen (see Tongue-in-kuchen). 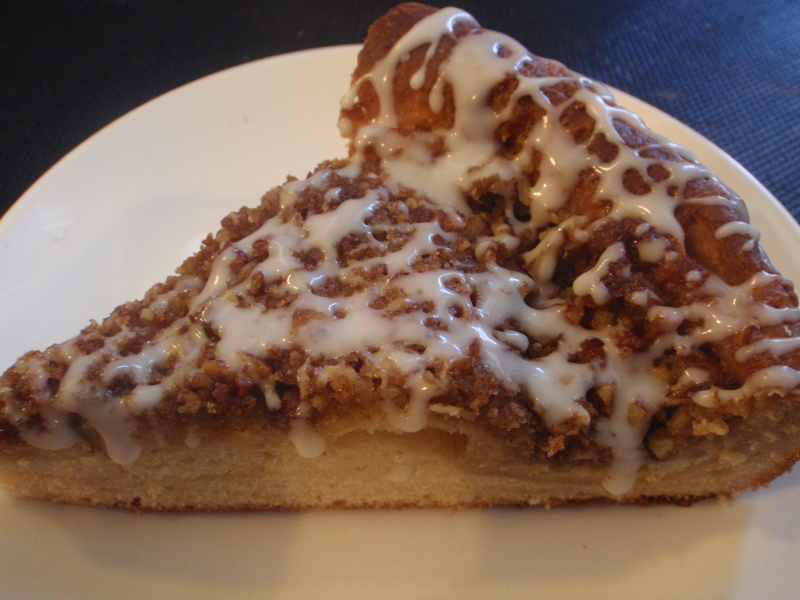 And kuchen reminds me of butterkuchen, which brings us to this somewhat kringle-y (another Midwestern favorite) coffee cake. I swapped the water for milk, doubled the sugar and added a touch more yeast to yield a cakier bread base. Then I sweetened up my filling and drizzled the finished “pies” with an easy glaze. 3 Tablespoons organic butter, melted, plus 4 Tablespoons organic butter, softened to spreadability. I love Organic Valley and Whole Foods has it on sale right now for $4.99 a pound. Get cakin’ and bakin’! 262 grams organic all-purpose flour. Whole Foods 365 brand in the 5# bag generally goes for the lowest price. 192 grams organic white whole wheat flour. I buy King Arthur brand in the 5# bag at WF. ½ cup organic yellow cornmeal. I usually use Arrowhead Mills. 4 teaspoons turbinado sugar. I buy this in bulk at Central Market. .I bring my own container and have the staff tare it for me. 1 ½ cups local milk. I use either Swede Farm Dairy or Wateroak Farm goat milk. 8 ounces local or organic cream cheese, softened. Light “neufchâtel” style is fine. Full Quiver Farm makes several sweet (as well as savory) flavors plus plain. Organic Valley makes great organic cream cheese and now Central Market sells their own brand of organic cream cheese, regular full-fat style, for only $1.99 for a half-pound block. 2 or 3 Tablespoons local honey. I usually use Good Flow wildflower, available in bulk at CM. Don’t forget to bring your own container. 154 grams (¾ cup) packed organic light brown sugar. Wholesome Sweeteners brand is on sale right now at Newflower Market for only $1.99 for a 1½ pound bag. Combine dry ingredients in the bowl of a stand mixer—this dough’s a little loose for hand-kneading—and whisk together. Be sure the yeast and salt to do not come into direct contact. Sans buffer, salt is toxic to bare yeast. Using the dough hook, start the mixer and pour in first the melted butter (not hot) and then the water. Get the ingredients combined, then raise the speed to nearly medium and let the machine knead the dough for about 5 minutes, until the dough amasses, looks smooth and feels slightly sticky. Turn out into a buttered bowl, cover and let rise until almost doubled. A cooler rise promotes more flavor development, so go ahead and put the bowl in the laundry room or garage while you go pick the kid(s) up from school—wait, school’s out! 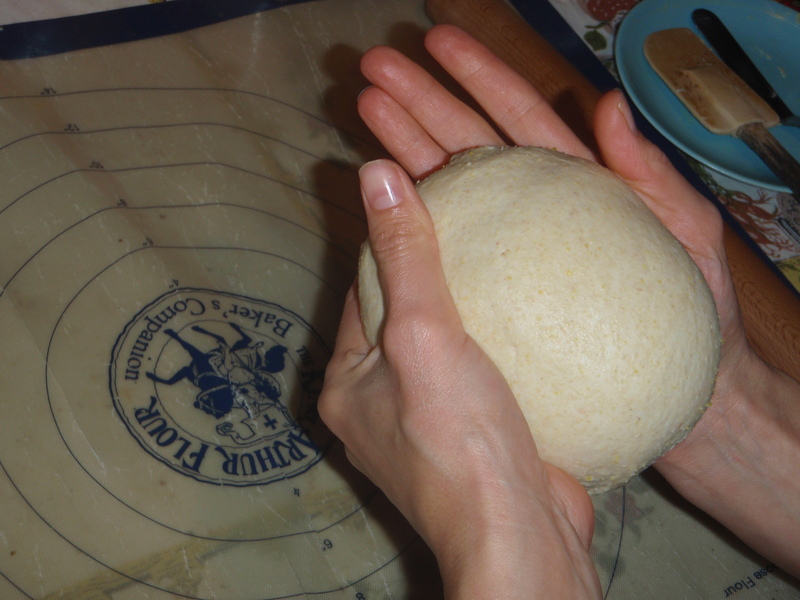 Press the dough down and turn out onto a flat surface for rolling out. 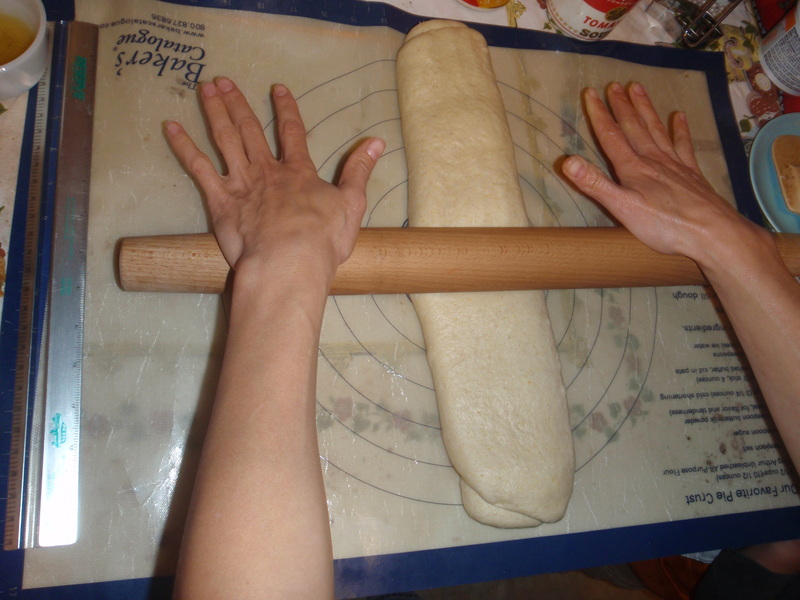 I prefer using a silpat or other rolling mat so I don’t have to incorporate any more flour into the dough. 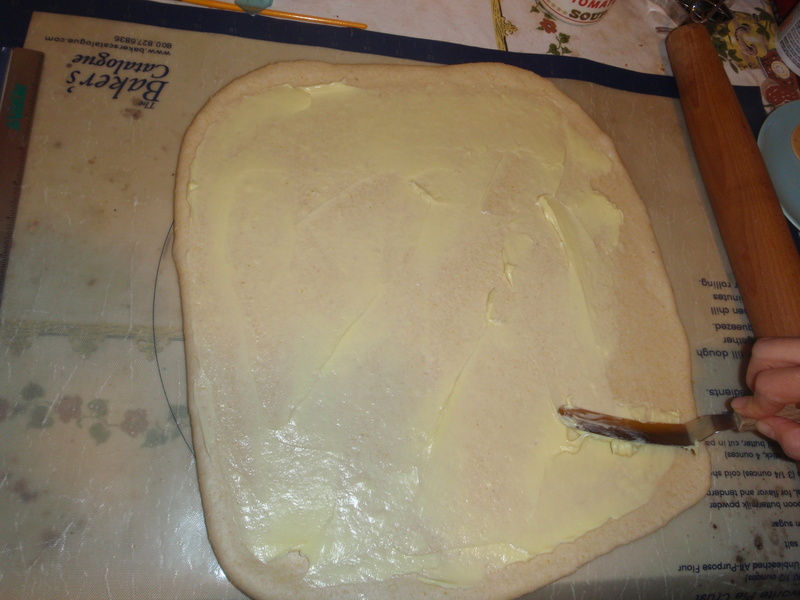 Roll the dough into a 15″ X 12″ rectangle and spread the softened butter over the surface to within about ½ inch of the edges. 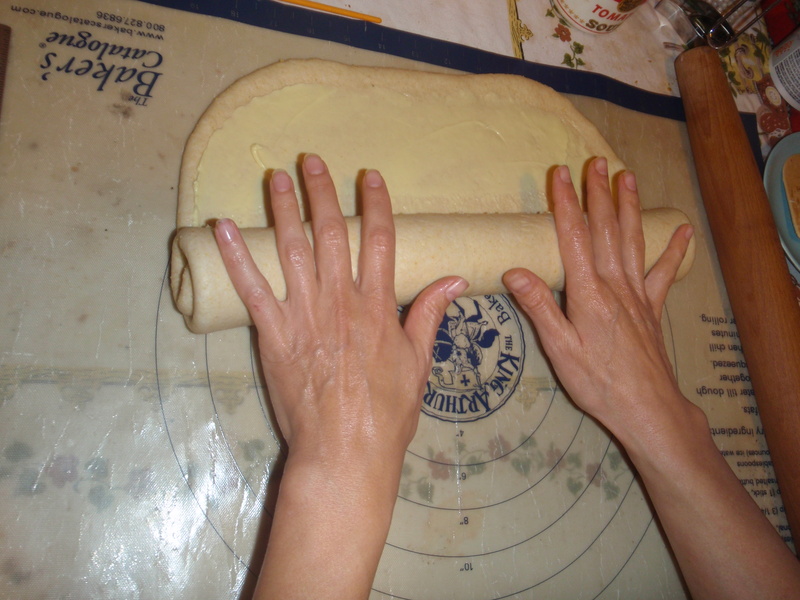 Starting at a short end, roll up the dough tightly, jellyroll-style. Pat the roll out into about an 18″ by 4″ rectangle and divide this strip into 2 pieces (cut across the spiral, not lengthwise). Take each strip and fold the ends towards the center, approximately folding into thirds, and smooth each piece into a ball, seam side down. Place the balls back into your buttered bowl and refrigerate for about 50 minutes for the second rise. 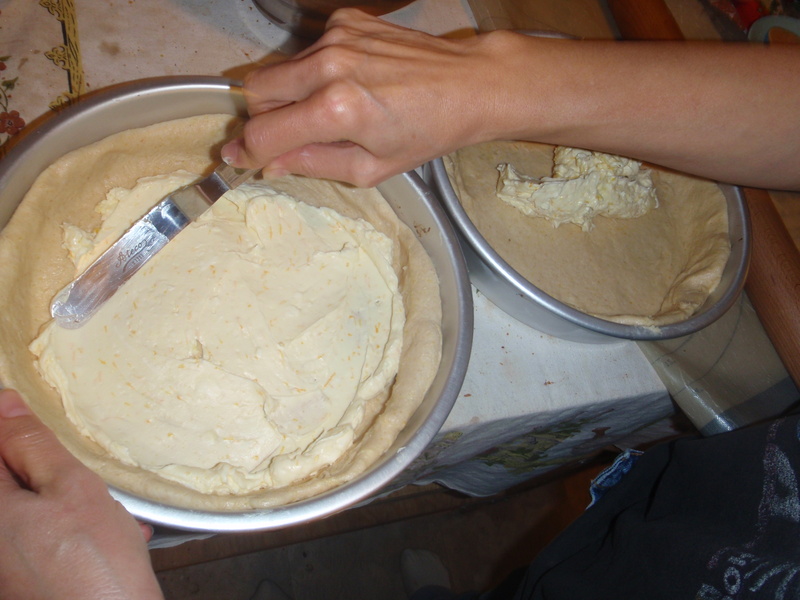 For the filling, blend the cream cheese, honey and zest. For the topping, combine the pecans and next 3 ingredients in a food processor and pulse to chop the pecans a bit. Then pulse in the butter just until cut in. 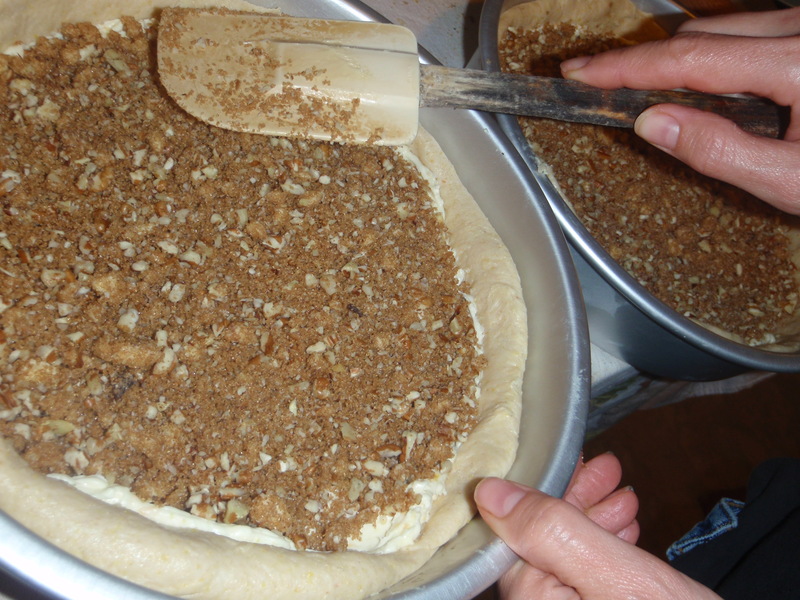 Don’t overprocess the topping into a mass, keep it crumbly. Pat each ball down and roll out (separately) into a 13″ circle. 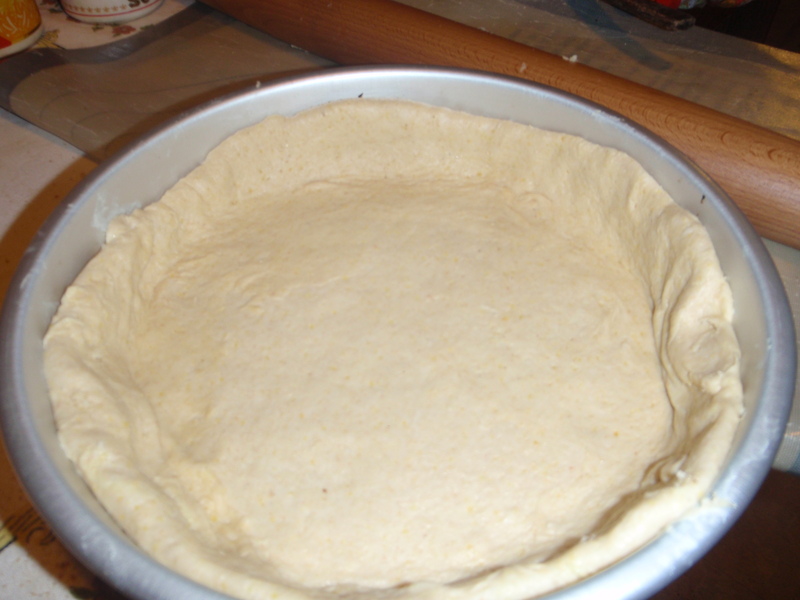 Fit each circle into a well-buttered, parchment lined 9″ X 2″ round cake pan. I recently bought a set of two such pans by Wilton at Michael’s craft store using their 50% OFF coupon. Many cakers already know about Michael’s weekly 40% OFF and occasional 50 % OFF coupons and take advantage of the savings on decorating supplies. But even if you don’t cake or decorate, if you bake, you can score some sweet deals on supplies such as pans, spatulas, whisks and cooling racks. And you might find yourself inspired to embellish your creations on the cheap! So be on the lookout for the Michael’s weekly flyer in your mail or check the Statesman (Sunday or Wednesday, typically) and save a buck. 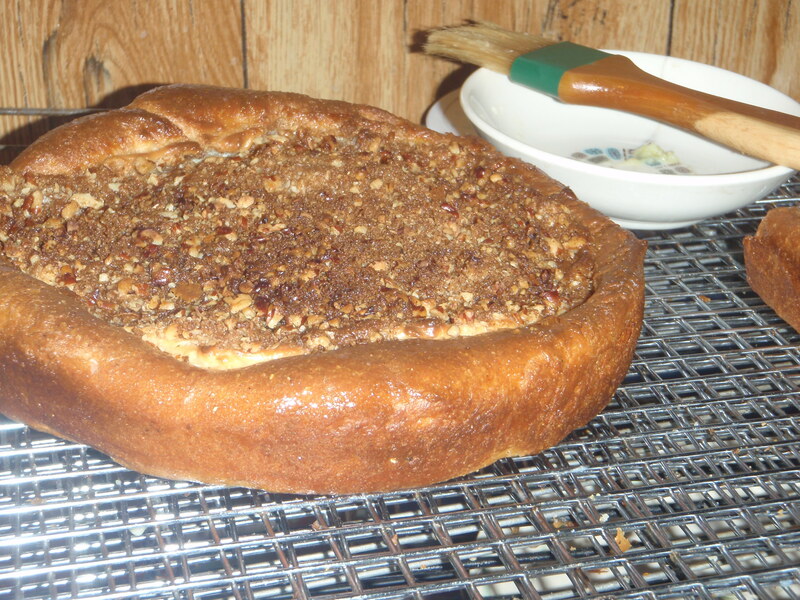 Spread the the cream cheese filling over the dough and top with the pecan mixture. Bake in a preheated 400º oven for 15 minutes, then reduce the heat to 350º, until browned and set in the center. Let cool in the pans on a rack for 10 minutes before loosening sides with a metal spatula and unmolding. Brush with the melted butter or ghee and continue to cool until warm, then whisk together the glaze ingredients and drizzle over the cakes. Serve with hot chocolate on Christmas Day! Was it Thursday again?—Already? These weeks just fly right by. I’m always smearing our pizzas with some sauce concoction or other and today the combination of ingredients umamified my pies such that I had to share the” recipe”. No pictures today. Our camera’s battery broke so we sent it to the vet—I mean camera doctor. ½ cup toasted almonds or other nuts. Newflower Market is still selling bulk organic almonds for only $6.99 a pound. Local pecans are in season now, available at our farmers markets and Navidad Farms. 1 or several garlic cloves. I’m still buying elephant garlic from Hairston Creek Farm. Morning Glory Farm may show up with more of the stinking rose tomorrow. 2 ¼ to 2 ½ ounces arugula (about 4 cups, loosely packed). Flintrock Hill sells conveniently bagged rocket. 2 teaspoons turbinado sugar. I buy this in bulk at Central Market. 3 Tablespoons dried basil or about a ½ cup fresh. about ½ cup pitted olives. I used spiced oil-packed black olives (on clearance for $1.99 a jar at CM.) Other varieties will work. Check out Texas Olive Ranch‘s Texas-grown olive offerings at our farmers markets. 1/3 cup organic miso, any style. I used South River sweet white miso from Whole Foods. 1 28-ounce can organic whole tomatoes—I like Muir Glen, preferably “fire-roasted,” drained, crushed with your hands and drained some more. I put everything except the tomatoes into the food processor and let ‘er whirl. Then I stirred in the toms. Add more salt if necessary. I slathered the crusts, which I made with organic whole gain spelt flour (at a little less than half the total flour called for) and organic all-purpose flour—see Pizza 1.5 for basic recipe. I used a touch more water for this batch, which yielded a lively, bubbly dough that baked up brown and crisp as all get out (I added a minute or two to the baking time because of the looser sauce and moister dough.) So if you find some whole spelt flour in your freezer, try it out for your pizzas! Dusted with reggiano and dotted with mountain gorgonzola (a freebie from work), peppered with sliced local red jalapenos (for the grownups) and feathered with frills of sliced local red onion (napped with olive oil), this week’s umami-pies tasted almost meatily satisfying. I know it’s only Friday, but who says you can’t bake pizzas on the weekend?! Thursday is Pizza Day at our house. As I usually don’t work on Thursdays, I frequently make our pizzas. I like to concoct “sauces” based on whatever ingredients we have on hand, so that could mean anything from spinach and toasted pecan or almond pesto, Texas mushroom duxelles, or simply sauteed seasonal veggies, minced or pureed. Roasted tomatoes, if discovered hiding in the fridge, will also make their way onto the pizzas, but typically topically, and not as a spread. Though the family always seems to relish our pies, I do wonder if my 5-year-old wishes sometimes for pizza with a “normal” sauce! Necessity’s sister, expediency, being the mother of slap-dashery (what kind of family is this? 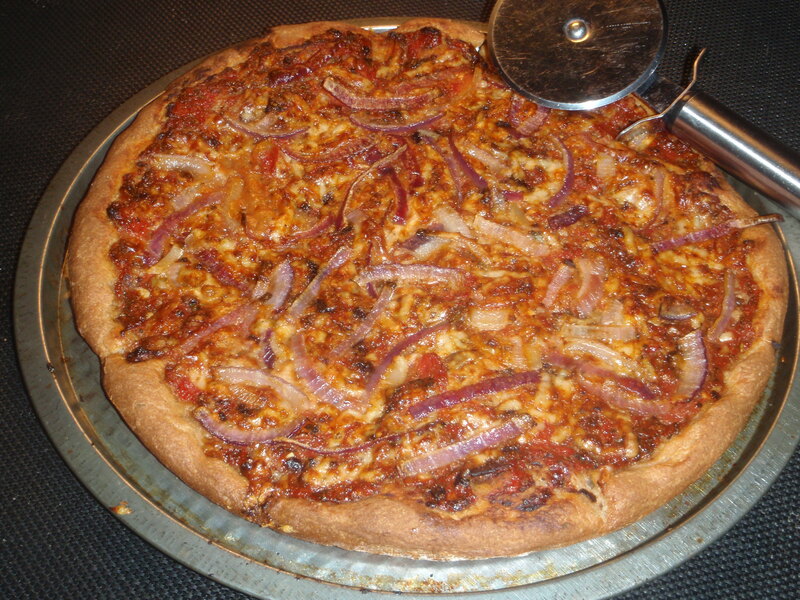 ), led to a recent Thursday’s time-crunched pizza sauce. one 6-ounce can organic tomato paste. I use Muir Glen. If you sign up for their “Connoisseurs Club,” you will receive a coupon offer immediately. one 14.5 ounce can organic diced tomatoes, well drained (use a sieve). Muir Glen’s Fire-Roasted are my favorite, but right now Sprouts is selling 28-ounce cans of Muir Glen organic love apples, assorted varieties (but not fire-roasted) for $1.99. Use half a can’s worth. a couple teaspoons of olive oil, Texas Olive Ranch or organic. a teaspoon or so of dried oregano. If you’ve got the time and resources for fresh herbs, go right ahead and triple the quantities. a teaspoon or so of dried basil. a 1/4 teaspoon or so dried thyme. 1, 2, 3, 4 or more cloves of garlic, minced or pressed. Use local if you have some. Organic domestic is my next choice. Stir everything together. That’s it. Now you’ve got a “regular” pizza sauce. If you have a spare minute or two, you can warm up the olive oil in a very small skillet and bloom the seasonings (don’t do this to fresh basil) to bring out their fragrance. Because I send my kindergartner to school every Friday with leftover pizza slices, and because the baby is growing and eating more, AND I’m still fully lactating, two pizzas no longer suffice. Now I must pizz’er in triplicate. I offer here the new formula for three crusts. See my pizza post for complete directions. 450 grams flour–I use about 225 grams organic white whole wheat and 225 grams organic bread flour or all-purpose flour. This is approximately 3¾ cups total flour. Of course you’ll be dividing the dough into three pieces, instead of two. Now there’s enough. The Central Texas mid-summer heat has done in many of our local tomato plants. I’m still finding romas and smaller types at the farmers markets. These are perfect for slow-roasting in the toaster oven. I line my baking pan with a sheet of parchment and toss in the tomatoes, halved lengthwise. I give ’em a healthy drizzle of olive oil, a pinch each of dried oregano, dried basil, dried thyme, small pinch of ground coriander and a tiny pinch of ground fennel plus lots (you decide) of black pepper. Stir them around and align them cut-side up. Now they’re ready for your 300º oven, where they’ll bask for an hour and a half or so, til they’re as done as you want. These sweet gems are just right for pizzazzing your pizza. Here’s how I usually make mine. 300 grams flour–I usually use about 160 grams kamut and 140 grams bread flour or all-purpose flour. This is approximately 2 1/2 cups total flour. Place the ingredients into your bread machine in the order listed, unless your machine directs otherwise, and program it for the “dough” cycle. Making pizza at home in the summer uses a lot of energy (unless your forno is out back) with all the heatin’ up and requisite coolin’ down you gotta do. But at least you can put your bread machine outside. If you’re up for grilling your pie, check out Fine Cooking magazine’s helpful video instructions for grilled pizza. My bread machine’s dough cycle runs 2 hours, so when about 30 minutes remain I heat my oven to 400º for a thick pizza or 425º for thin ones. I use a pizza stone (make sure it’s in the oven now!) and of course they’re frequently available at the thrift stores for a bargain price. For a thicker crust, I use a 12″ X 1 1/4″ round pan and for thinner crusts I use a mismatched set of 10″ and 12″ very shallow round pizza pans. There’s no reason you can’t use squares or rectangles if that’s what you have. I line the pans with parchment paper and oil them up very well with olive oil. 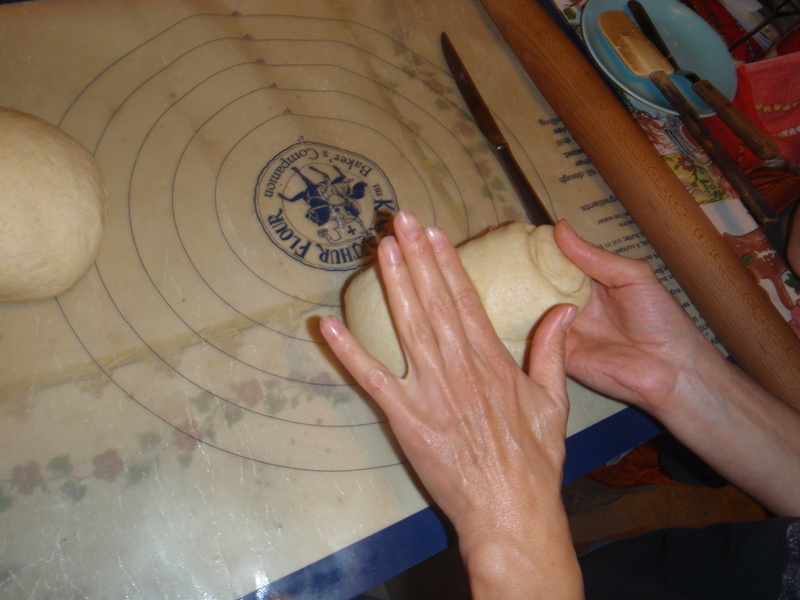 When your dough is ready, use liberally oiled hands to remove the dough and place it onto your pan(s). Give the dough a minute to rest and then you can start gently stretching it to fit your pan. If the dough resists your efforts, give it a respite to relax. It’ll loosen up. 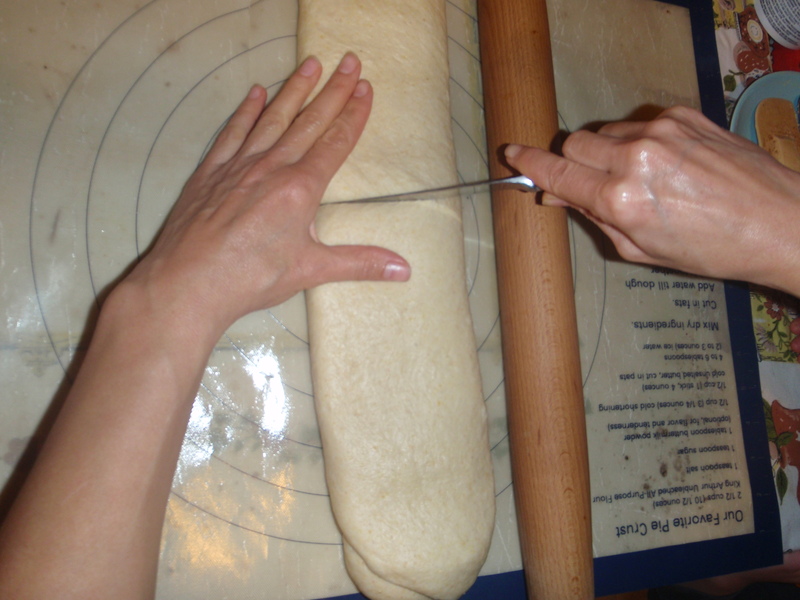 Once your dough is stretched, top it how you please. Just don’t overload your pizza or the crust will sag with sog. 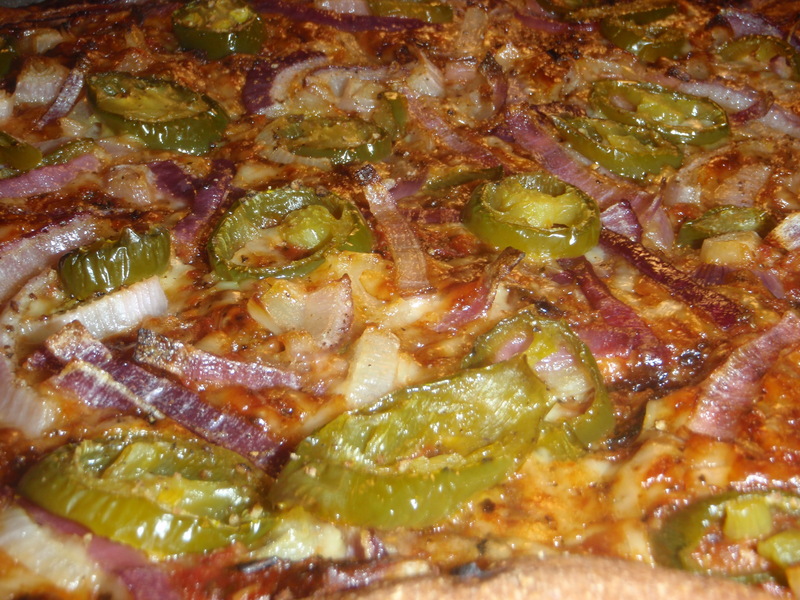 My pizza toppings vary with the season, my larder and my whims. Lately I’ve spread them with homemade arugula pesto, minced garlic-stuffed Texas green olives, shredded Full Quiver Farms mozzarella or any of our many fine local goat cheeses, grated pecorino romano and sliced local sweet onions tossed w/ olive oil. 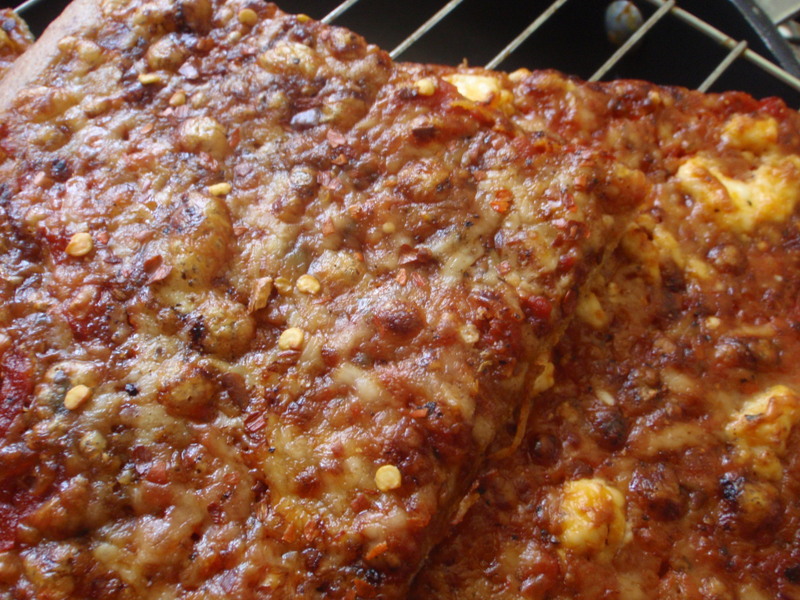 A sprinkling of dried oregano, black pepper and crushed red peppers zests it up. After 20 minutes (10 minutes for the thinner crust) I remove the pizza from the oven, top it with some roasted tomatoes (coarsely chopped or not), take it out of the pan and place it directly on the baking stone. I raise the oven heat to 425º if it’s not there already. For the crispin’, the thicker pizza may take around 10 minutes and the thinner around 8. Remove to a cooling rack and don’t burn yourself!